>I can’t stand it when people block an intersection or run a red light. It causes road rage in me more than anything else that can be done. You can cut me off, you can not use your turn signal, you can even drive 50 mph in the fast lane on the interstate. But, if you run a red light and / or block an intersection, then I will murder you with my thoughts. There is an intersection near my job that puts me through this pain every single work day. This exchange is on a very busy street and if you get stopped by a red light, then you’ll have to wait about three minutes before the next opportunity. Now, three minutes doesn’t sound all that bad, right? But, what if you wait your three minutes and you can’t move because some idiot crossing in front of you is blocking the intersection? Now it’s six minutes. I’ll tell you a story of what happened to me recently so you’ll better understand why this perturbs me to so much. 5:10 PM – I’m in the burgundy Lamborghini Buick on the diagram above. Now, before I could arrive to my spot, the idiot in the blue car decided instead of waiting for traffic to clear before leaving the gas station, that he would instead just pull out and block two lanes of traffic. He wants to get into the turning lane to go left, but he’s stuck because no one will let him in. Lesson #1: Don’t pull into traffic unless you have some where to go that doesn’t impede the flow of traffic. 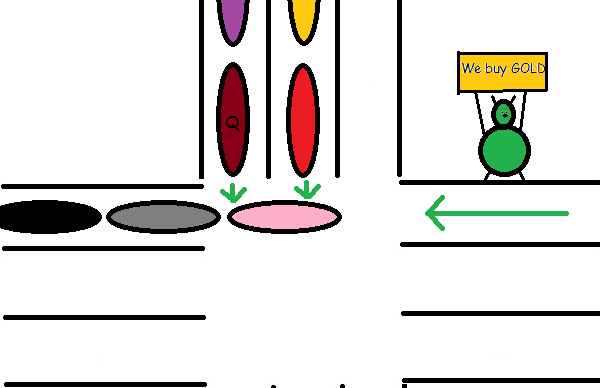 5:12 PM – The turning lane light gives the green arrow and eight cars make it through, but Car #9, the black car shown above, never got a chance to turn, so she now has to wait. My light and the light for the brown car turns green, but we can’t go any where because of the idiot in the blue car. Now, the person behind me is looking at me like I’m a hickey on a priest and it’s my fault we’re not moving. Again, this is a very busy intersection. It is not uncommon for up to 30 cars to be waiting to turn left at any given time. So, we never get a chance to advance through the light which is now red again. 5:16 PM – The black car now has the green arrow, but the idiot in the blue car still has to hope that the gray car (or one of the 10 cars behind it) is nice enough to let him in. And if you leave a gap longer than a car length ahead of you on this street, the light will start to change! Of course it’s my luck that on this particular day, the idiot in the blue car does not catch a break to get into the turning lane. 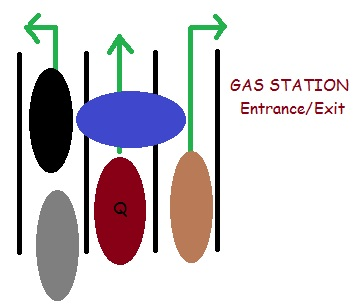 But, instead of backing into the gas station and getting out of the way, he sits there for yet another cycle. 5:17 PM – Once again, the light is green for us, yet we can’t move. I blow my horn out of frustration, but the idiot in the blue car is deaf. Seriously, he’s not deaf, he’s just doing that “I’m-ignoring-you-because-I’m-in-the-wrong-and-can’t-face-you-like-a-man” bit. I’m in my signature James Bond BMW Buick trying to go to work. As the traffic crosses in front of me, I notice that the cars are starting to slow down. Slowly, this idiot in a pink Mary Kay Cadillac decides to creep into the intersection despite the fact that she has no way of clearing the intersection. She’s basically praying that she clears the lane before he light turns red. Well, that stupid idea didn’t work. Lesson #2: Don’t start to cross into an intersection until there is room on the other side for you to clear all crossing lanes. Now the idiot in a pink Mary Kay Cadillac has a red light and guess who has the green? Me! But can I go any where? No, I can’t go any freakin’ where although driving across the hood of her car did cross my mind. So, here we are with two lanes of traffic blocked because someone decided that they were more important than we were. That her time was more valuable than ours. And how dare we blow our horns at her! After all, what was she to do? She was forced to pull into the intersection prematurely and block two lanes of traffic, right? I should blame the cars ahead of her for not being little Smart cars and allowing her extra room to move forward, right? You’re wrong, woman! Even the guy in dancing in the alien suit with the “We Buy Gold” sign is shaking his head at you! Idiot. 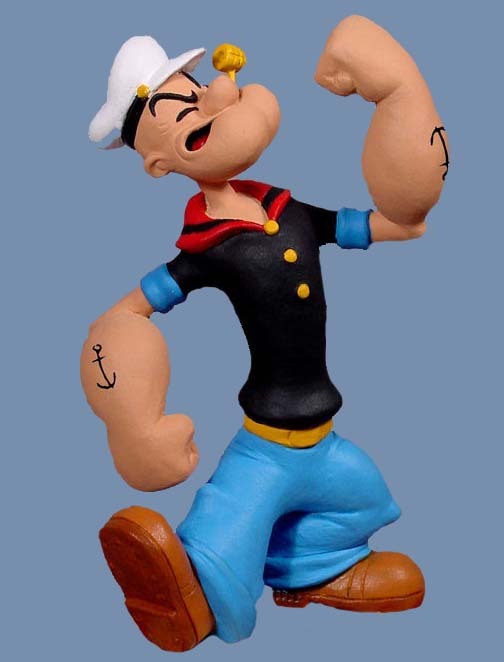 If throwing bricks from your vehicle were legal, my left arm would look like Popeye’s. These scenarios happen to me at least once, sometimes twice a day. If you run red lights and / or block intersections/traffic, then you should have your license revoked. Because if you have the attitude that your time is more than important than anyone else’s time or safety, then you don’t deserve to drive. 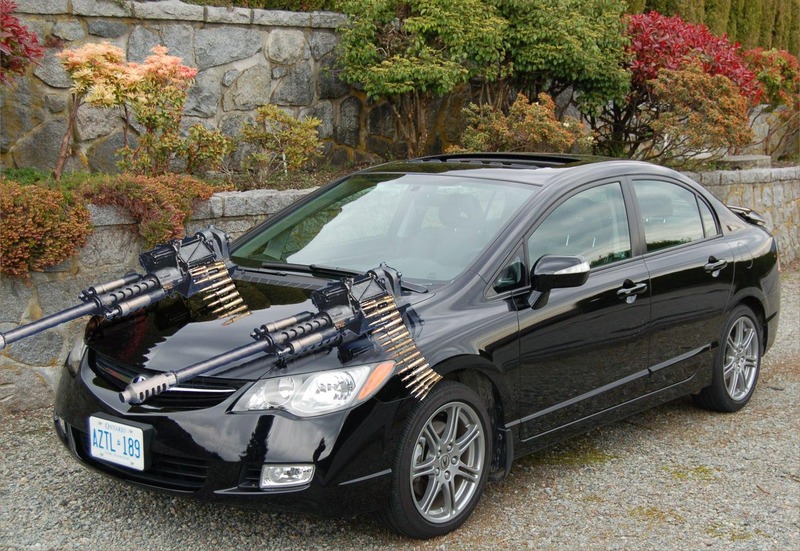 In fact, not one of you reading this has the right to drive. Lesson #3: Driving is a privilege, not a right. If I had things my way, then there would never be a problem with this ever again at this intersection. At least not when people see my car coming down the block. That’s right, I have a fix for both of the above scenarios, but for some reason, I still can’t get a patent for my idea. >Listen to "Bad Habit" by the Offspring. This is my driving theme song.I'm raging just by reading this post!!! >Don't hurt 'em, B. LOL! LOL @ Reck! That sign idea would be awesome! I would love to express my feelings so that everyone around me knows who I wish I could run off the road! And I'm with you on the letting people in thing. The only thing worse than not being acknowledged for letter someone in is when you let one person in and the person behind them shoots out in front of you, too. I can't stand that! That is so rude!